Any fellow Australians out there will immediately recognise chocolate crackles. They are a staple birthday party treat, along with fairy bread, mini sausage rolls and frog in a pond (not as awful as it sounds – this was a chocolate frog in green jelly). Chocolate crackles are quick to make and can be made well in advance. 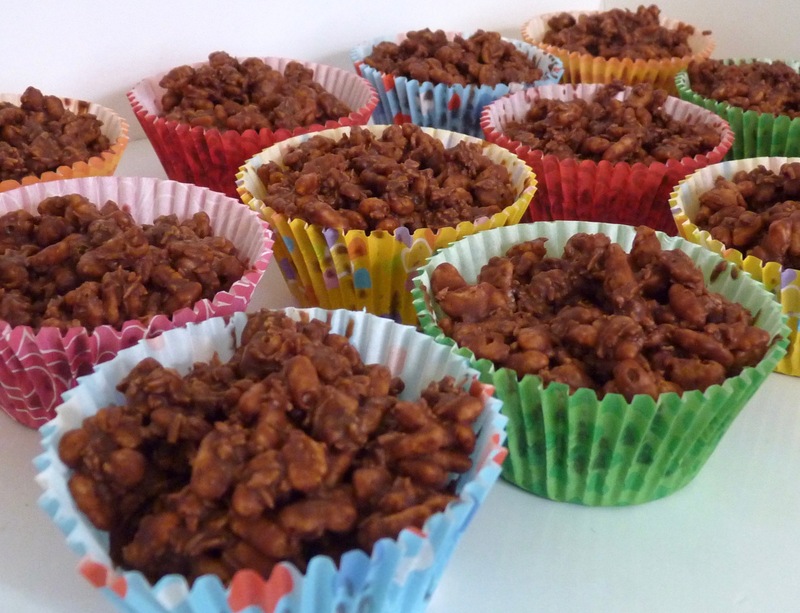 Because there is no baking involved, chocolate crackles are also a great, easy recipe to make with small children. Mix rice bubbles, icing sugar, cocoa and coconut in a large bowl. Gently melt the Copha, let it cool slightly and stir into the other ingredients. Spoon mixture into paper patty pans and refrigerate until set. Having promised to make chocolate crackles for a recent event, I was horrified to find that Copha (solidified coconut oil) is unique to Australia and doesn’t have an equivalent in the UK. What to do? Thankfully I found another recipe (from Green Gourmet Giraffe, which she got from The Sydney Morning Herald) that uses chocolate instead. Phew! Here is the alternative recipe. I’ve added in weight measures for the dry ingredients as Australian cup measures are slightly larger than UK or American ones. Mix rice and coconut in a bowl. Melt the chocolates together – I did this in a bowl over a pan of simmering water however it could be done in a microwave. Pour the melted chocolate over the dry ingredients and mix well. Now that half-term is coming up, this would be a good recipe to have up your sleeve if the kids get bored, or if you need a quick make for school fetes or parties.